This book restores a little-known advocate of Indian rights to her place in history. In June 1889, a widowed Brooklyn artist named Catherine Weldon traveled to the Standing Rock Reservation in Dakota Territory to help Sitting Bull hold onto land that the government was trying to wrest from his people. Her efforts were counterproductive; she was ordered to leave the reservation, and the Standing Rock Sioux were bullied into signing away their land. But she returned with her teenage son, settling at Sitting Bull's camp on the Grand River. 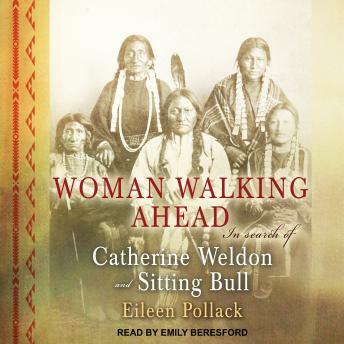 In recognition of her unusual qualities, Sitting Bull's people called her Toka heya mani win, Woman Walking Ahead. Predictably, the press vilified Weldon, calling her 'Sitting Bull's white squaw' and accusing her of inciting Sitting Bull to join the Ghost Dance religion then sweeping the West. In fact, Weldon opposed the movement, arguing that the army would use the Ghost dance as an excuse to jail or kill Sitting Bull. Unfortunately, she was right. Up to now, history has distorted and largely overlooked Weldon's story. In retracing Weldon's steps, Eileen Pollack recovers her life and compares her world to our own.